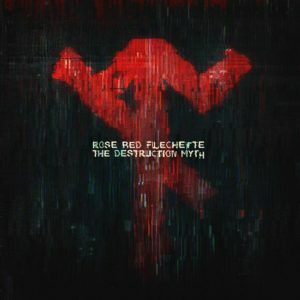 Rose Red Flechette‘s The Destruction Myth is a story of entropy and decay, death and destruction, things seen as evil, but merely part of the natural cycle. These tracks outline some of the more real human evils and injustices that speed that process along. We’ve been divided and thus controlled, had our truths buried by fallacy, our empathy declared a weakness, and our freedoms divorced from all responsibility. It is a cautionary diatribe to remind us there is indeed a point of no return, and no such place as “away”. Mastered by David Chaim Cohen at Xexify.com. Design by Thkgrfk. Released by Anomalistic and Splatterkore Reck-0rds. MP3 Download | FLAC Download | WAV Download · Download count: 8,054. The text sounds like the most deceitful religion in the world. Definitely, according to inutilis! the destruction myth is great update.. This one is not for the fainthearted. If U are into sunshine fullon boogie or such things you are not gonna like it. I like the experimental/off the beaten track approach, and for me it is refreshing to listen music like this which differs from nowadays self repeating psy standards. Don’t listen the underraters give it a go and unleash your evil self. This album is pure, relentless, avant-garde terrorcore. There isn’t really much like this out there. Its like black metal and psycore had a baby, and that baby got into some steroids and someone recorded it. It’s HEAVY and REALLY dark. Defintley not for the faint-hearted, but I absolutely love it. It’s incredibly shocking, twisted, malevolent, and so much more. Mmm… tasty. One of the most authentic work that i’ve ever seen, all tracks are 10/10 with some special flow that construct itself all long the track!